Even if the funding agreements go through, local administrations, especially intelligence operatives, create many hurdles in the implementation of projects. 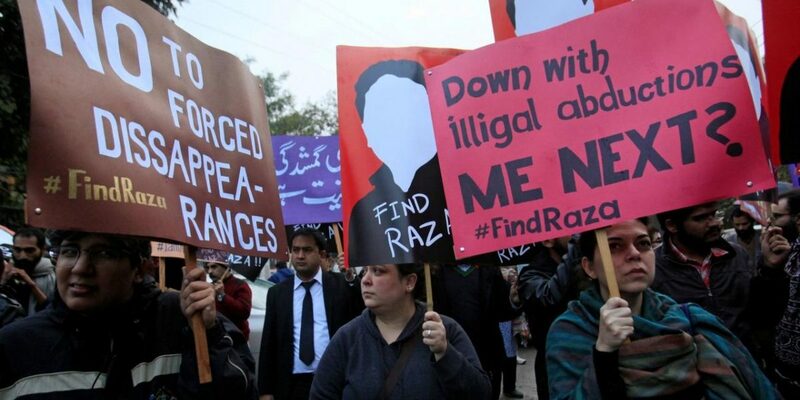 FILE PHOTO: Demonstrators hold placards calling for the release of Raza Mehmood Khan, a member of Aghaz-i-Dosti (Start of Friendship), a group that works on peace building between Pakistan and India, during a protest in Lahore, Pakistan December 11, 2017. REUTERS/Mohsin Raza/File Photo. In strictly legal terms, there is no ban on the operations of non-governmental organisations (NGOs) in Pakistan. Yet, in the span of a few years, this once thriving sector has reached the brink of extinction. This is well in line with the current version of statecraft in which an overzealous state apparatus is stifling all voices and avenues that offer a national narrative different from the one espoused by this apparatus — all of this being done without breaking any law. International NGOs have been the first to face this strategy. Being foreign entities, they have to sign agreements with the federal government each time they intend to fund any projects in Pakistan. For decades, they have got approval for such agreements without any major problems. Over the last few years, however, the approval processes have been getting slower. In some cases, the delayed processes have ended in no agreements. In others, signing of agreements was delayed so much that the funds available for the concerned projects lapsed (because most foreign NGOs are required to consume their funds within specific time frames). The government provides no reasons for delaying or refusing the agreements. The applicants, instead, are intimated that working in Pakistan is not their right but a privilege granted by the government at its own pleasure so the government is not bound to follow any rules and principles vis-à-vis the agreements. Even if the funding agreements go through, local administrations, especially intelligence operatives, create many hurdles in the implementation of projects. They enter NGO offices at any time, sometimes seeking project-related documents and at other times asking hostile questions and issuing aggressive instructions. The default perception among government functionaries at the local level is that NGOs are some ‘non-combatant foreign enemies’ that need to remain under a permanent watch. Having a foreign staff member serves as ‘the final proof’ that an NGO has ‘ulterior’ motives. Local NGOs are facing even bigger obstacles. They have to seek project-to-project based permissions from the federal government even if their donor has already signed an agreement with the relevant authorities for the same project. It is, of course, extremely difficult for organisations working at the district level to navigate the corridors of power at the federal level. In yet another administrative measure to choke the workings of the NGO sector, many national-level non-government entities have been told by their respective registration authorities to submit an affidavit to declare that they are neither receiving any foreign donations nor will they accept any in the future. These, effectively, are orders to shut shop. Ostensibly, the clamp down is being enforced in the name of compliance with the latest conditions imposed by the Financial Action Task Force (FATF), a global forum, which has put Pakistan on its grey list for not doing enough against money laundering and terror financing. The task force wants the country to improve its regulation of the not-for-profit sector which in many cases has worked as an important link in terror financing. Many religious organisations and charities, including some that have been banned by the government, are registered under the same law that governs NGOs working in the development sector or for human rights causes. Technically, the latter are becoming collateral damage in the war against terror financing. The damage, however, is not unintentional. Instead of making any attempt to separate NGOs from entities involved in terror financing, the government is trying to settle some imagined score with the NGO sector as a whole. This is not something new though its intensity is unprecedented. Successive governments have sought to delegitimise NGOs by promoting the same rhetoric that conservative religious groups espouse. The organisations working for regional peace are dubbed anti-state and unpatriotic. Those active against child labour are accused of undermining Pakistan’s economy. And the ones championing equal rights for women are alleged to be working on a western agenda that runs ‘contrary’ to our religious and cultural traditions. There is nothing wrong in a government, or anyone else for that matter, critiquing the efficiency and effectiveness of NGOs as agents of change and development. Asphyxiating them, however, will certainly not make us a better country or a better society. Tahir Mehdi works with Punjab Lok Sujag, a research and advocacy group focused on understanding governance and democracy. The article was originally published on Herald. Read the original article.